Lent . . . Sacrifice or Renewal? We nurture our relationship with God as we live our faith. We know our connection with Him gives us the grace to grow through the easy days and the challenging days. The beauty of nurturing—of really investing in—our relationship with God is that all the benefits of that investment on our part come back to bless us! It’s really kind of a sweet deal. Lent provides us with a reminder and plenty of weeks to put a unique focus on strengthening our faith in preparation for Easter. Sacrifice is a common element of our strengthening process during Lent; it’s meant to help remind us on a daily, or at least a weekly, basis that we need to examine and enrich and improve our commitment to living our faith. Our sacrifices can be favorite things we decide to do without during Lent—such as a certain television show every week or desserts every evening. Our sacrifices can also include new things we chose to do—like saving a certain amount each week to make a special donation to a local charity, or adding an extra rosary or a visit to Church every week. Either way (or even both approaches! 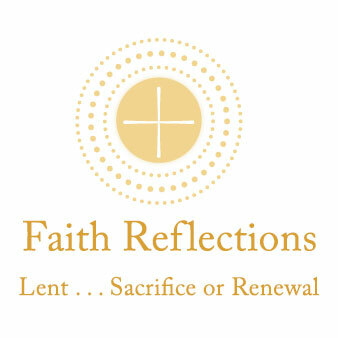 ), we commit to an extra effort to be mindful of just how central our love of God is to our life. This increased discipline of sacrifice throughout Lent often begins on a physical level; through earnest reflection and prayer we actually arrive at Holy Week spiritually energized. We may have found a thing or two we could improve on in how we live our faith. But at the end of Lent we hopefully have also found a renewed conversation with God and a renewed peace within ourselves—the peace that comes from knowing, truly knowing, He is always with us.